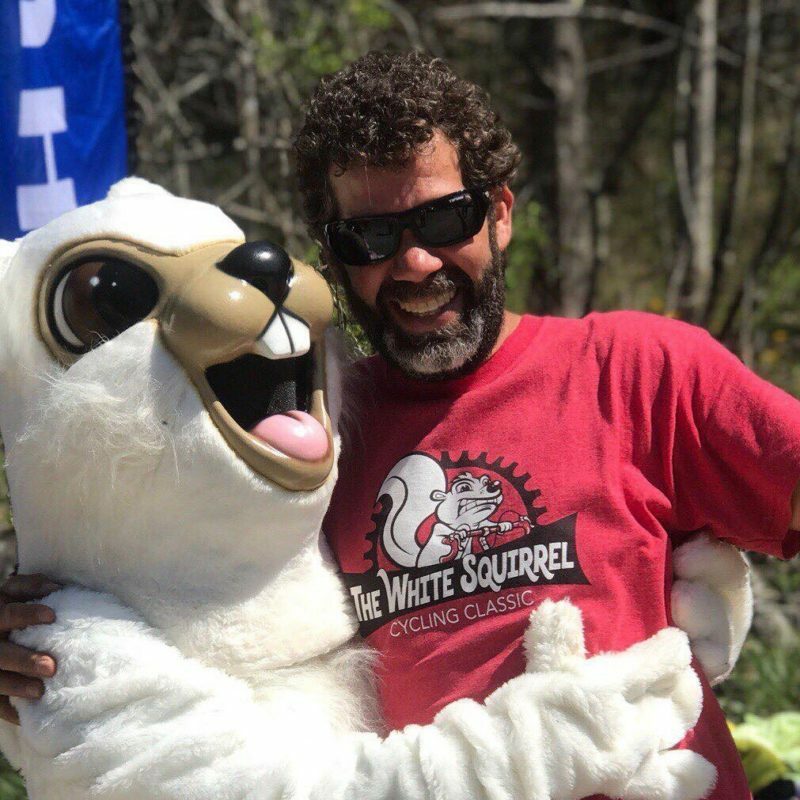 Thursday April 12, 2018 Stage 3 is sponsored by Sycamore Cycles, and is the White squirrel Route. Pisgah forest was populated with white squirrels after a circus train carrying them tipped over quite a few years back. This stage offers 29 miles and 5118 feet of climbing! With most of the trails being so close to Brevard, these trails are quite popular with the locals. Racers fighting for position at the start at the bottom of Black Mountain. The race starts at the bottom of Black Mountain. Racers immediately funnel into double track up Grassy Rd and over to a rooty fast decent down Sycamore Cove. From there racers loop back around to Thrift cove over to climb/hike-a-bike up black mountain. 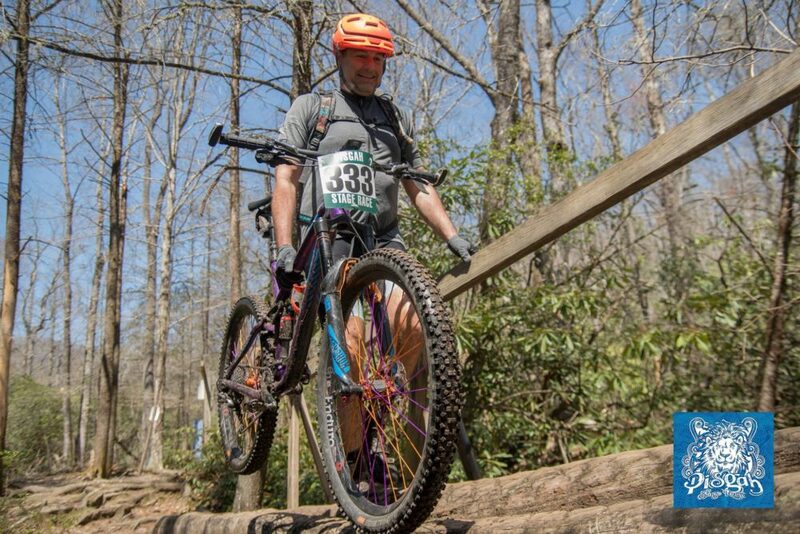 A fun decent down Buckhorn gap brings you to the 2.25 mile enduro section on Avery Creek. 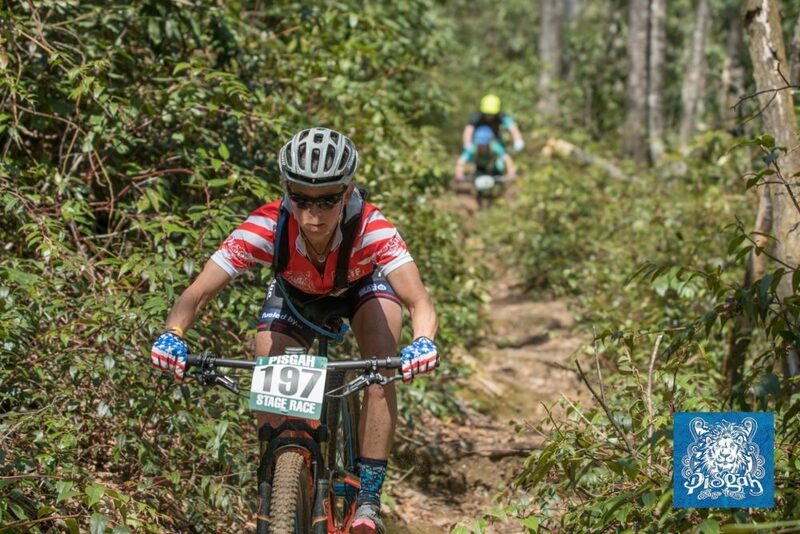 This downhill sections offers a little of everything from roots, rocks, drops, creek crossings and smooth fast hammer sections. 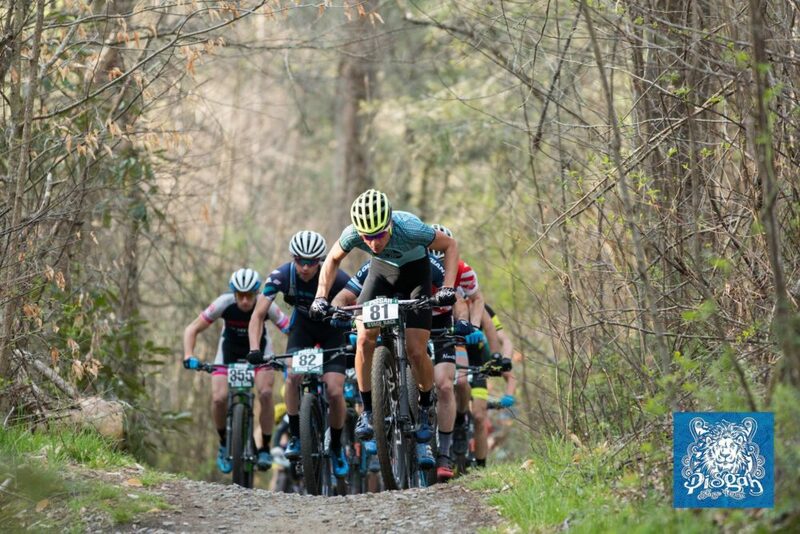 Carey Lowery (Women’s Masters leader) tearing up the downhill. Sketchy bridge crossing after the Avery creek enduro. 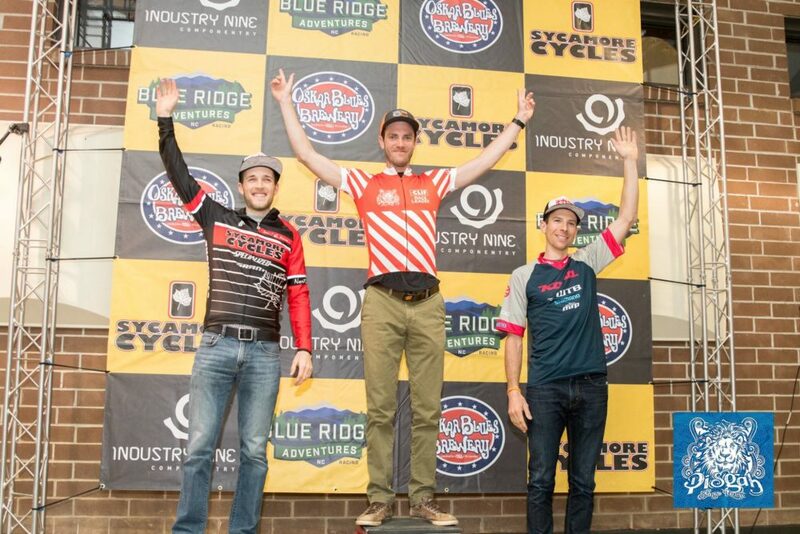 Taking the win for the day in Men’s open is Travis Livermon from NC with a time of 2:31:30. Stefano Barberi from CA came in 2nd at a time of 2:33:03 and finishing 3rd is Tristan Cowie from NC in 2:34:03. After stage 3 Travis now takes the lead in the overall Men’s Open. On the Women’s side, Jeana Greaser had another strong finish 3:11:52. Coming in 2nd is Ada Xinxo at 3:17:56 and Jen Nielson 3rd with a time of 3:27:06. The standings in the Women’s Open remain the same. Race director Todd Branham awaits racers at the finish line. 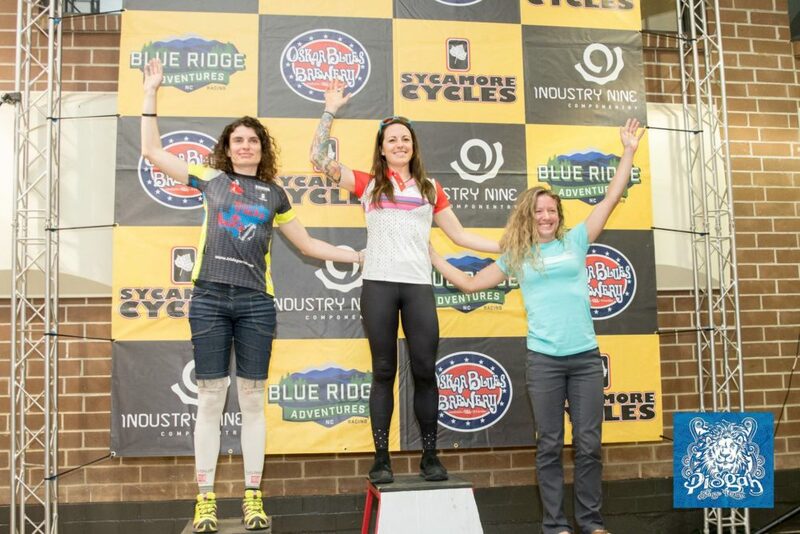 This entry was posted in EST Time Zone, News, Ultra Endurance, XC Racing and tagged Avery Creek, Black Mountain, Mountain biking, Pisgah Stage Race by Shannon Boffeli. Bookmark the permalink.